Chris, welcome back! How was your trip? Thank you! It was great – it’s one of the most incredible places I’ve ever been to. I got there in low season so I captured fewer people/tourism shots than planned. Instead, I looked for things that sparked my interest or gave me a sense of serenity. 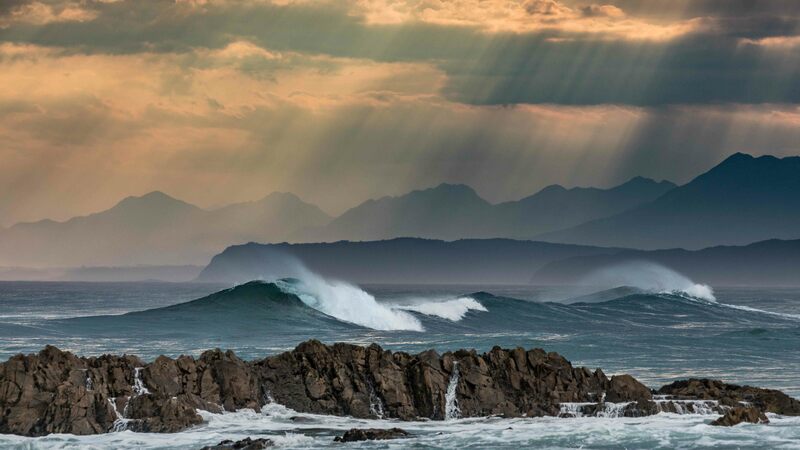 I think this picture of the coast at Goukamma Marine Protected Area was one of those serene moments – it really sums up the raw beauty of the place. Do you think it’s possible to tire of this landscape? When you are surrounded by this landscape on a daily basis, I guess you could become blasé about it. But all the staff I met were still in awe of its spectacular beauty. One of the ladies said to me, “It’s like working in paradise.” Each day the scenery is different because of the way the light and the clouds roll down the valley. The reserve is famous for its flora and it’s like a constant light show as different flowers come into bloom. Outstanding beauty is everywhere. It feels completely wild but it is still accessible. 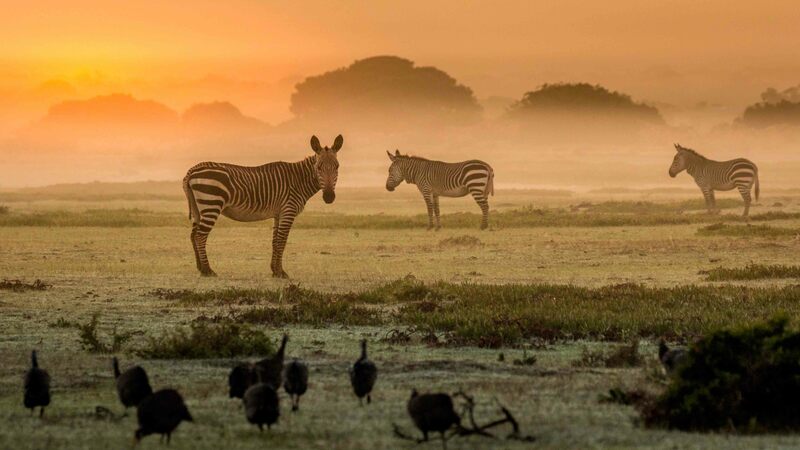 People often go to South Africa to see the reserves with the big five – leopard, rhino, elephant, buffalo and lion – but there’s so much more to South Africa; like this morning shot of the zebra. I call them the ‘quieter big moments’. If you had returned to this spot two hours later, once the sun had risen higher and started to pierce through, it wouldn’t have looked so extraordinary. But if you make the effort to get up early, it’s incredibly beautiful. This picture sums up why I do this job. Whether I achieve my intended picture or not, just to be out there at that time of day is a privilege. What was the main challenge in photographing these parks? The concept of distances is very different in Africa. I soon learned that “just over there” meant a four hour walk so I had plenty of trekking with heavy equipment to do. Also, it’s such a vast area that I found it hard to know where to start. Having permission to use my drone really helped, as it enabled me to capture the majesty of the reserves and demonstrate the enormity of the task of managing them. Were there any scary moments being out in the wilderness? Not at the time, but in retrospect there was. 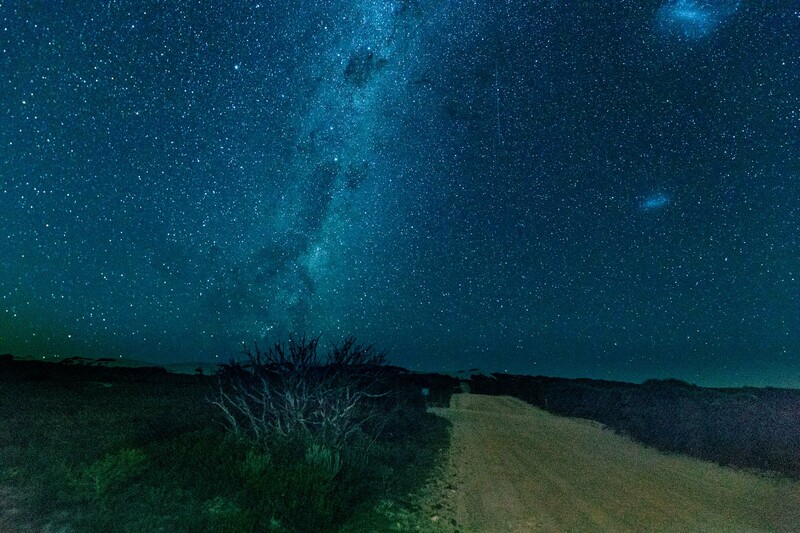 I popped out of my lodge on my own one night to take some pictures of the night sky which was spectacular. When I returned, my hosts reminded me that night time is leopard time. I probably had a few feline eyes watching me but luckily I’m here to share this wonderful image with you! Which picture brings back fond memories? Both of these ladies were from the Eastern Cape and had relocated in search of a better life. This photoshoot was the first time in their lives they had been the protagonists – they were the stars of the moment! I’m not one to force images. I never tell somebody to give me a smile. They were very happy and proud of their jobs and it comes through in their faces. This picture will always remind me of their infectious enthusiasm and singing. Siphosethu Bobotyana (in the front) is from the EPWP which is the Extended Public Works Programme. A government initiative to bring local people into employment throughout the community. 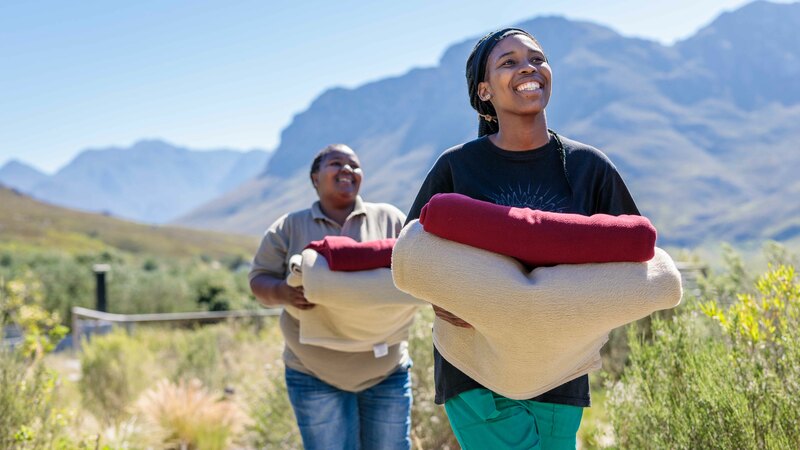 The new starters ‘cut their teeth’ with employment, engage with the training that CapeNature provides, and then graduate to fully employed members of staff. Nontobeko Mosiuoa (behind) works directly for CapeNature and started on a guide training programme. The guide programme hasn’t fully launched yet so she’s still waiting to get going. Petrus Lamini trained as a teacher and then became a well-known chef in Plettenberg Bay. But he grew up in the forest and has an incredible knowledge for plants and animals. 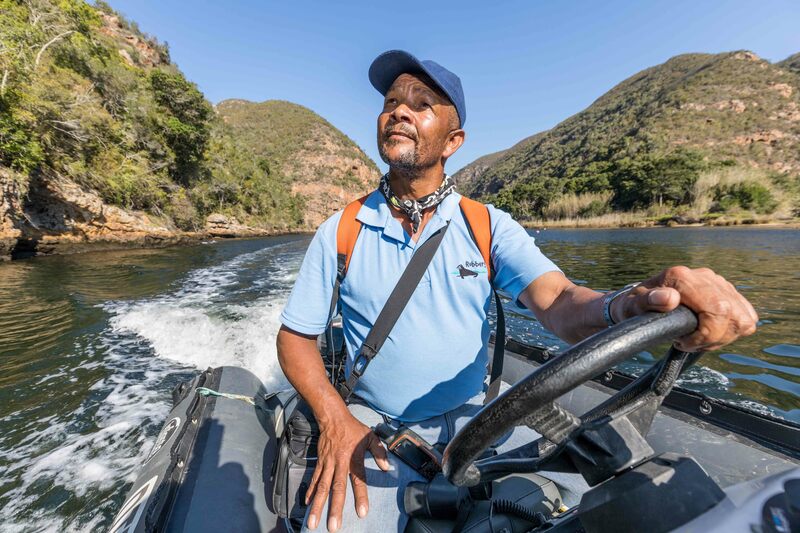 He realised that that was where his passion lay and decided to change his career and go to work for CapeNature as a Field Ranger. His job is to police and patrol two of the reserves. His knowledge of the natural world is phenomenal and he has a great ability to communicate. We spent an amazing day together with him imparting all his knowledge and passion. Had I wandered around on my own, I would have learned a fraction of the amount and I certainly would have been oblivious to the conservation and management issues. Hanging out with him gave me a sense of how I needed to act responsibly within these reserves. We could have spent weeks and weeks together – it was a beautiful symbiotic relationship and one of the highlights of my trip. You can really see his potential to become a guide. The expertise and the workforce is there – just waiting for the jobs and opportunities. What are your thoughts on our project with CapeNature? I understand the Travel Foundation is researching the feasibility of developing add-on services such as shops, cafes, catering, housekeeping, porterage, guiding or transport services. If the project works, I think it can only be positive as it will support local employment and enterprise. I got the impression that the will of the local people to work is huge but there needs to be more possibilities. All the people I met were very enthusiastic to hear about the Travel Foundation’s new partnership – they saw it as a step towards a positive future and greater stability for them. I can see the passion in your photography – where does it come from? I was born in Uganda (I left as a young boy) so I’ve always had a love of African landscapes but I’m also very aware of the fragility of nature. The tiny, tiny role I play in the part to protect it, is a privilege. It’s quite easy to photograph negative environmental impacts but there’s compassion fatigue and these images become ‘normal’. People want good news stories. It’s an incredible luxury to be allowed to go to these places and see and document the positive things that happen with the Travel Foundation. To think photography is my job, is amazing! Finally, can you sum up the best thing about South Africa? Everybody always signs off, whether on the telephone, shaking of hands or email, with “lots of love to you and yours.” It’s a country full of love and they pass it on very willingly. The love for their country simply seeps out of their pores!